Though Pradesh Congress Committee and councillors have welcomed the Supreme Court order giving temporary relief to 18,000 traders from the sealing drive, the Confederation of All India Traders (CAIT) expressed disappointment over the order, saying that the decision of temporary relief would benefit only a section of the community. The revenue department has reportedly tightened the noose around those who are trying to palm off farmhouses at rates of commercial land in Noida and Greater Noida. The Delhi Urban Development and PWD Minister, Dr A. K. Walia, today exhorted Public Works Department engineers to expedite the completion of all under-construction projects in Delhi for better development of infrastructure before Commonwealth Games 2010. Following the temporary relief given to traders by the Supreme Court, the Centre today said it was instructing the MCD to survey more roads in the Capital to be notified for commercial or mixed land use to provide relief to traders from the court-ordered sealing drive. Encroachment in commercial areas has become a common sight in the city today. Shopkeepers usurp the public land not caring two hoots for the rules and regulations. 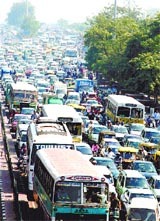 Traffic woes of Delhiites continued for the third straight day today as several parts of the city witnessed major disruptions due to a massive rally taken by CPI trade unions. After its success in building low-cost houses in Bawana industrial area, the Delhi State Industrial and Infrastructure Development Corporation (DSIIDC) has been invited by African countries for constructing similar structures on their land. The UP’s Principal Secretary (Transport) has replied to the letter sent by the Principal Secretary, Transport, Delhi Administration, on the dispute between DTC and UP Roadways. The National Human Rights Commission (NHRC) has asked the Director General of Police, Haryana, to submit within four weeks a report on the alleged beating of a resident of Gurgaon by the police recently. Mata Sundri College for Women, University of Delhi, celebrated Students’ Council Day today. Dr T. R. Kem, Secretary, UGC, was the chief guest. He inaugurated the colourful and culturally rich handicrafts exhibition organised by the students of the college. A Delhi court today remanded a court employee to five-day police custody in connection with the theft of documents in the Uphaar cinema fire case. Of the total 25,000 traders, 18,000 had submitted their affidavits before the court for the voluntary closure of their commercial establishments. However, Congress leaders and councillors, who were apprehending a defeat in the forthcoming municipal elections due to the sealing drive, heaved a sigh of relief following the court order, sources said. Praising the efforts of the MCD and Urban Development Ministry, the DPCC president Ram Babu Sharma welcomed the court’s direction in which traders had been given relief. “The government will make an amendment in the Master Plan to declare notified roads for commercial or mixed land use,” he said. The Chairman of the Standing Committee said that councillors in the Capital were happy over the court order. Meanwhile, the Leader of Opposition in the MCD, Mr Subhash Arya, also expressed reservation over the order, saying what would happen after January 31. He accused the Congress of misguiding traders by giving baseless statements. The task force of western UP stamps department has raided over a dozen builders in Greater Noida who have allegedly sold farmhouses at commercial rates. The task force has taken over the possession of all such properties. Joint Commissioner, Western Zone, Ajay Kumar Goel said stamp duty with penalty will be recovered from all the buyers of these properties. He said these people have evaded stamp duty worth Rs 50 lakh which will be recovered from them. The western region stamp duty commissioner had received a tip-off that a large number of farmhouses have been developed in Noida, Greater Noida and other districts which are being sold at price ranging from Rs 1,000 to Rs 2,500 per sq yard. Registries of such properties are being done at Rs 1.50 lakh per bigha as agricultural land, thus depriving the state exchequer of a sizeable revenue. The task force, set up at the commissioner’s orders, has raided over a dozen such builders who have fleeced the government by selling the land at agricultural rates. These farms have been set up on village land in Jaganpur, Doab, Gulistanpur, Nangla Nangli, Nangla Behrampur and Dostapur villages. Fencing, electric poles, huts and tubewells have been completed in these farms. According to Mr Goel, the forms published by these builders and other documents have been seized and a notice is being issued to all of them. He said in the first phase, revenue amounting to Rs 50 lakh will be recovered from these builders and later task force will nab similar culprits in other districts of western UP. Dr Walia made a round of the Disused Canal, Geeta Colony Bridge, Marginal Bundh Road and the entire Ring Road to take stock of progress of the construction work at the sites. He disclosed that the 3-kilometer Disused Canal Road from Karkari Mor to MB Road would be operational by March 2007. The new road would help in substantially decongesting the Vikas Marg. He added that a new technology was being utilised for construction of this road, which makes RCC Motorable within two hours of its laying. The road is being constructed over a drain and a 2-meter wide opening in between is being provided for cleaning of drain. The Minister disclosed that two engineers would make visits to Germany to study mechanised cleaning through the two-meter wide opening. The Disused Canal road will have four-lane, two-service lane and two footpaths. In order to provide relief to the choking Vikas Marg, while framing Master Plan 2001, it was decided that the existing Disused Canal may be converted in to traffic corridor and be developed as a feeder to a new bridge over Yamuna near Geeta Colony. Briefing reporters after a meeting of a Group of Ministers (GoM) headed by Union Home Minister Shivraj Patil on sealing, the Union Urban Development Minister, Mr S Jaipal Reddy, said the MCD would carry out a fresh survey and prepare an additional list of roads that could be notified for commercial or mixed land use. He said that one per cent traders who had big showrooms and would be required to create parking spaces in pursuance of the court order would be given assistance by the government in doing so. Mr Reddy made it clear that in the posh A and B category colonies, commercial activities would be allowed only on the ‘Master Plan’ roads and not on the inner roads. He, however, said the Central notification permitting mixed land use in residential areas had the provision that commercial establishments could be allowed in such areas if the RWAs made a request in this regard. “We have received some requests from the RWAs and we will consider them,” Mr Reddy said. Sadar Bazaar, New Railway Road, Old Railway Road and Gurdwara Road are the areas where almost all shop owners have encroached upon five to 15 foot space on the main road in front of their shops. Sanju Jain, a leading shopkeeper, regretted that the roads in Sadar Bazaar, the main market of the district, are used by the shopkeepers to display their commodities. Municipal Council had recently made a footpath before the shops in Sadar Bazaar so that pedestrians could use it. 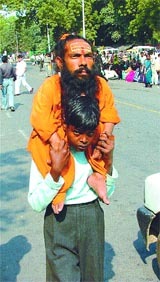 But the shopkeepers have occupied the footpath, Mr Jain lamented. About five to 10 foot of the space is covered with saleable items to attract the customers. Some shopkeepers have even let out open space in front of their shops to ‘rehri’ owners who sell fruit and other items, caring little for the visitors. The shopkeepers at New Railway Road and Old Railway Road have gone to the extent of covering even more than 15 feet and are blocking the road in front of their shops, pointed out advocate Arun Sharma, a resident of New Railway Road. The district administration and vyapar mandals take no action to remove encroachments. The office-bearers at different vyapar mandals in various markets serve their own political interests and have nothing to do with the welfare of the markets or the visitors, alleged a shop owner, Mr Ashok Gupta. The administration is equally responsible for the present state of affairs as in every press conference, the issue is raised but the officials just offer lip service and claim that the action would be initiated against the defaulters. Recently, Mr Y K Gupta, Executive Officer of the Municipal Council, said that the MC would take stringent action to remove encroachments. Even the MC’s councillors have passed the resolutions a number of times to remove them, but no action has been taken. Ironically, the prices of shops are decided after considering the space in front of them. However, Mr V K Jain, president of Gurgaon Vyapar Mandal, said some MC officials and policemen take a fixed amount from the shopkeepers and ‘rehri’ owners and allow them to usurp the public land. On the other hand, the shopkeepers occupy the land to display the goods on road to attract the customers. If the administration and shopkeepers do not wake up, the day is not far off when Gurgaon markets would lose their importance. The fully air-conditional malls and the state-of-the-art markets have already started attracting a number of customers from the old markets, said Mr Jain. Major traffic snarls were witnessed in many parts of the Capital as vehicles were diverted due to the rally taken from Ram Lila Maidan to Barakhamba fly over, in the heart of the city. “The DSIIDC has already got invitations from some African countries to build such houses for them,” he said. Mr Singhal said that the DSIIDC would be building 40,000 houses in Delhi for weaker sections by Commonwealth Games 2010. The letter has alleged that DTC was plying its buses in UP without an agreement so these have been seized under rules. Earlier, Delhi Principal Secretary had in his letter alleged that DTC buses had been seized in UP against rules and this was causing hardships to the passengers. The DTC buses should be freed immediately, it had urged. According to Regional Transport officer, Noida, Vinay Kumar Singh, the Secretary’s letter has said that Delhi officials should come to Lucknow for a meeting to sort out all the problems and that till an agreement was signed, DTC buses cannot ply in UP. The UP Secretary had in his letter also mentioned that Delhi letter was silent as to under which rules UP Roadways buses were seized in Delhi and why these buses were not being released. Till these points are sorted out, DTC buses will not be released by UP, the official said. But it is the daily passengers—office-goers, traders, students and those who have to go to railways stations in Delhi and ISBTs who are the worst sufferers of this impasse. The Ghaziabad passengers can somehow reach the temporary bus stand at Kosambi but even buses having all-India permits are stopped as soon as they enter Delhi. Taking suo motu cognisance of a news report which said that Jirender Singh Sandhu was beaten for about 20 minutes as he had asked the policemen to behave properly, the NHRC has directed that a copy of the news report be sent to the DGP, Haryana. The Commission demanded that the outcome of the departmental inquiry be intimated to them. It said that the whole incident raised a serious issue of violation of human rights of the citizens. According to the news report that appeared in a national daily on November 17, Sandhu was taking a stroll with his daughter when two policemen stopped them and asked what they were doing. They also asked him the identity of the girl. When Sandhu told them that she was his daughter, the policemen expressed doubts and asked whether it was actually so or whether she was of loose morals. When Sandhu asked then to behave properly, they allegedly took him to the police post and beat him up. According to the Senior Superintendent of Police, Gurgaon, the three policemen involved in the incident have been suspended, pending a departmental inquiry into the incident. Dr Kem inspired the students with his motivational address, saying that Mata Sundri College was centrally located. It could attract very good students if it had a hostel. The UGC could give Rs 2 crore for the construction of a hostel. Mr Balbir Singh Vivek Vihar, Chairman, Governing Body, presided over the function. Mr Harinder Pal Singh, Treasurer, Governing Body, graced the occasion. Mr Amarjit Singh Chawla and Mr Harpal Singh, both Governing Body members, also graced the occasion. The college Principal, Dr Satnam Kaur, welcomed the dignitaries present. Swati Kanodia, president of the Students’ Council, presented the report. There was a cultural fiesta and DJ for the students, which was thoroughly enjoyed by them. The Additional Chief Metropolitan Magistrate sent Dinesh Chand Sharma, a former record keeper of the court who was arrested yesterday, to police custody till November 27.